In 1992, Indiana University journalism professors David H. Weaver and G. Cleveland Wilhoit surveyed 1,410 journalists who 'work for a wide variety of daily and weekly newspapers, radio and television stations, news services and magazines throughout the United States.' Presenting the results in the Fall 1992 Media Studies Journal, they found journalists were more liberal, more Democratic, more in favor of legalized abortion and less religious than the public at large. 44 percent of journalists identified themselves as Democrats while just 16 percent tagged themselves as Republican. Thirty-four percent described themselves as independents. 'Compared to the overall U.S. population, journalists are 3 percent to 10 percent more likely to say they are Democrats, depending on which national survey you use as a yardstick, and 10 to 17 points less likely to say they are Republicans,' they wrote. 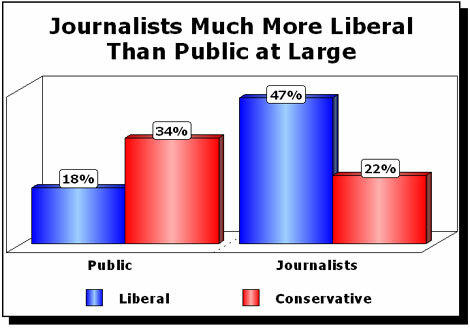 Nearly half of the journalists surveyed (47 percent) called themselves 'liberal,' compared to 22 percent who described themselves as 'conservative.' Gallup polls taken at the same time found just 18 percent of the public considered themselves liberal, while 34 percent of the public said they were conservative. 'The percentage of journalists rating religion or religious beliefs as 'very important' is substantially lower (38 percent) than the percentage in the overall U.S. population (61 percent). More than half of journalists (51%) said abortion should be 'legal under any circumstances,' compared to just four percent who thought abortion should be 'illegal in all circumstances.' Among the general public, 33 percent wanted abortion 'legal under any circumstances,' and 14 percent thought it should always be illegal.